Earlier this year a vascular surgeon diagnosed his own cancer while testing out a new ultrasound gadget for his smartphone. Dr. John Martin, who is not an oncologist, was tapped to test out the Butterfly iQ, a tiny ultrasound device designed to replace several bulkier, more expensive machines. When he noticed some discomfort in his throat, he decided to give himself a scan with it. The resulting image, fed from the scanner to his iPhone, gave Martin the worst possible news in a clear and easy-to-read way: he had a mass and it looked cancerous. Thanks to the Butterfly iQ and his iPhone, he’s since received treatment. 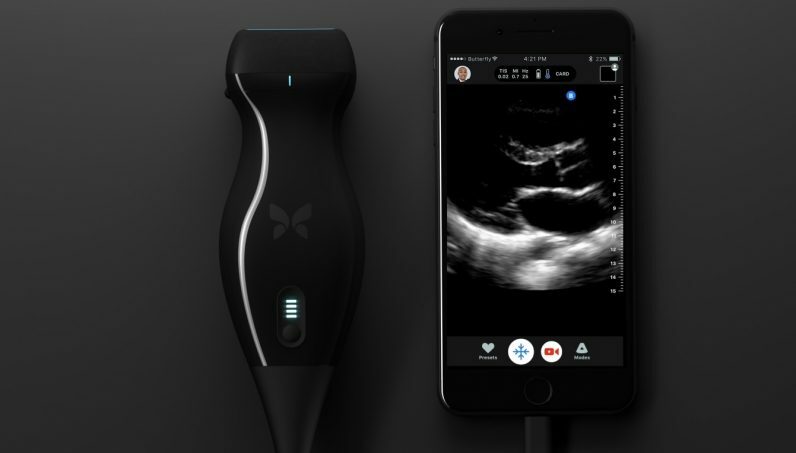 If it were just a “portable ultrasound” for iPhone that’d be mildly interesting, but this device doesn’t just miniaturize some tech to try and make a buck. It’s disruptive: it does things better than more expensive devices do. There’s several things about this product that make it very, very different. Number one is that you can use one single transducer that can be deployed to look at structures that are in the near-field, and then structures that are deeper in the body. I mean, just that very basic principle, that I no longer need to need to change transducers – that, in and of itself, just completely revolutionizes, blows up, the entire ultrasound playing field. The pocket-sized device from Butterfly Network will cost less than $2,000, and works like something straight out of “Star Trek.” It’s the first of its kind in the US, eschewing traditional methods of ultrasound – vibrating crystals – for 9,000 tiny little drums on a semi-conductor. Portable ultrasound machines have been around since the 1970’s, but even the most modern ones are too big to fit in a pocket, use hardware far inferior to the iPhone, and require skilled technicians to use. That’s not even getting into the cost – the closest competitors this device has retail for thousands more. The company also plans on implementing AI into the device, which will transition it from something that requires some medical know-how to use, to a gadget capable of guiding novice-hands and providing incredible medical insights. With AI interpreting the machinations of the human body through a device that’s accessible to someone who has no formal training in the medical field, the term “revolutionize” seems like an understatement. Anyone who has ever spent hours or days waiting for a qualified technician to use a series of giant, outdated machines for diagnostic scanning, only to spend further hours or days waiting for a physician to review the results, will appreciate this device. But there’s an uphill battle for a device that threatens to disrupt healthcare. There’s less money to be made in empowering doctors to easily diagnose patients in minutes with inexpensive equipment, than the status quo. The industry makes its trillions by slowly shuffling dying people back and forth from station to station, technician to physician, and one facility to another. And it isn’t going to take kindly to anything that doesn’t line the coffers of the thousands of board members and investors who view healthcare efficiency in dollars instead of lives. In the United States even the simplest of procedures, like getting a blood test, can run hundreds of dollars. The survivors who were wounded in the Las Vegas massacre are faced with bankruptcy in the face of their medical bills. Maybe it’s time we started checking the receipts. If a vascular surgeon can detect cancer with an iPhone, a lot of people are getting ripped off by healthcare facilities charging five-figure dollar amounts, often per visit, on imaging alone.